Please complete the online Declaration of Major/Minor form by clicking here for the Office of Undergraduate Education webpage containing OUE Forms and then choosing (and submitting online) the "Declaration of Major/Minor Form." After submitting your request by way of that form, you must click here to make an appointment with Brandon Mitchell, our Undergraduate Program Coordinator. At that appointment meeting, Brandon Mitchell will review with you the sociology requirements and the sociology opportunities available. He will also assign you a regular faculty adviser. This Faculty Adviser will be an important source of information about the program, course planning, and career options. Click on the links below for information on the types and numbers of courses associated with the Emory Sociology Major or the Emory Sociology Minor. Sociology plays a prominent role in other majors on campus. To give but one example, the Media Studies Major has a notable sociology component: five of our courses count towards the MS Major, and two to three of our faculty are regular lecturers in the Intro to Media Studies Class (FILM 204). Two particular majors are especialy notable: the joint major in Sociology and Religion and the Sociology Track of the Quantiative Sciences major. You can learn more about majoring or minor in Sociology by contacting our Emory Sociology Peer Mentors. 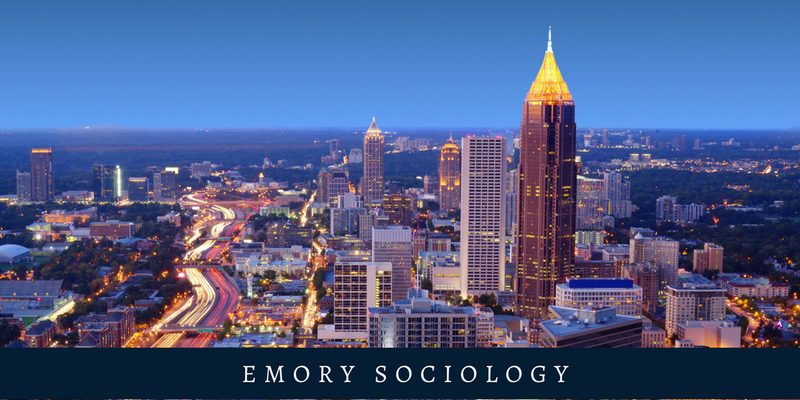 They can provide you with a student's perspective on the ins and outs of the major or minor, as well as make recommendations regarding classes, opportunities and faculty at Emory Sociology.